There is no better way to use up leftover holiday turkey than by whipping up this super-easy twist on a classic poutine recipe right at home. Whether prepared right after Thanksgiving or for the festive season, this easy-to-make recipe is a great way to use up that leftover roasted turkey. The homemade oven fries are simple to make, and the rest comes together in mere minutes! Poutine lovers and turkey lovers alike will be in heaven! Cover rimmed baking sheet with foil; spray with cooking spray. Cut potatoes into 1/2-inch-thick lengthwise wedges; place in large bowl. Add oil; mix lightly. Bake 35 min. or until potatoes are tender and golden brown, turning after 20 min. About 10 min. before potatoes are done, bring gravy, ketchup, Worcestershire sauce and dry seasonings to boil in saucepan, stirring frequently. Add turkey; mix lightly. Simmer on medium-low heat 5 min. or until heated through, stirring occasionally. 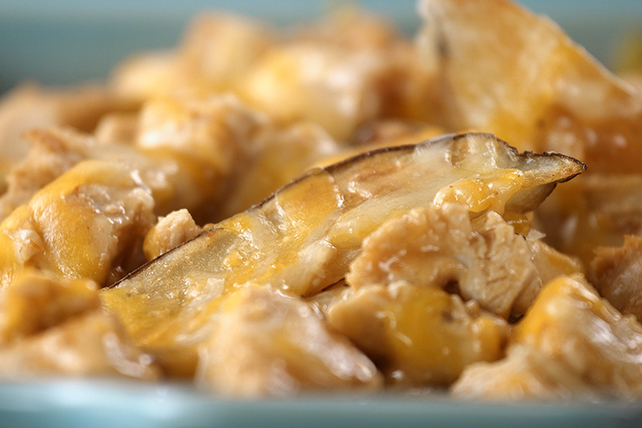 Spoon potatoes into shallow ovenproof dish; top with gravy mixture and cheese. Bake 2 min. or until cheese is melted. For richer flavour, prepare using Heinz Beef Gravy. Reheat 1 cup leftover prepared stuffing. Spoon gravy mixture over the partially baked potatoes, then top with the stuffing before sprinkling with the cheese and baking as directed.